Tax Justice Aotearoa, a coalition of community and union groups, has spent $15,000 on ads in major newspapers, billboards and buses. It’s also calling for tax cuts for low to middle income-earners and hikes for the highest paid. Spokesperson Paul Barber responded to questions from the Taxpayers Union about the source of the money used to pay for it. Mr Barber from the Council of Christian Social Services earlier told RNZ the group’s campaign had been largely supported by the Public Health Association. The association’s a registered charity which is partly funded through a contract with the Health Ministry, but also receives donations from the public. . . Registered as a charity, partly funded by the Ministry of Health and spending money on a political campaign? . . . But Mr Barber said the ads were paid for from donations, and the Public Health Association only contributed by offering communications support. Services in kind for a political campaign still isn’t right from a publicly funded body. 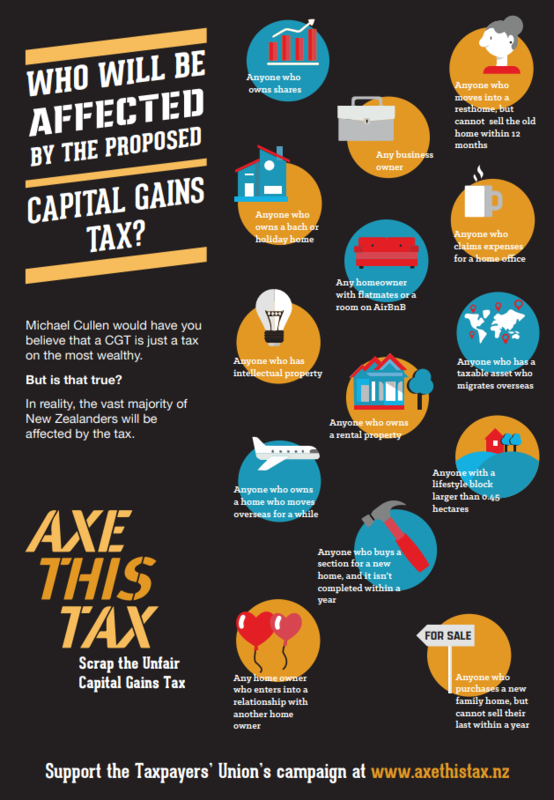 New Zealanders do not want a capital gains tax (CGT) – not on their investment property, not on their farms or businesses, and definitely not on their KiwiSaver. Newshub has been given exclusive access to a Reid-Research poll commissioned by Business New Zealand that shows an overwhelming majority of voters – 65 percent – don’t think a CGT should be a priority for the Government. The poll found that just 22.8 percent think it should be a priority. And nearly half of voters – 47.8 percent – say the CGT debate has harmed the Government, while 33.1 percent say it hasn’t, and 19.2 percent don’t know. David King, a waterproofing and industrial coating master, spent 26 years building his business Modern Maintenance Products from scratch. And it’s endorsed by Parliament – he just finished fixing up a bunch of MPs’ leaky homes. But King told Newshub he’s livid about a potential CGT on his business. That’s the case for a lot of small businesses people. They work long hours and pour their profits back into the business leaving little if any for other savings. The majority – 54.3 percent – said “no”, while just 31.6 percent said “yes”. . .
On taxing property profits, half of voters pushed back. The poll found 49.8 percent don’t think there should be a CGT on property – the family home would be exempt. And that’s versus just 39.1 percent that support it. . . When it comes to KiwiSaver, voters say hands off. The poll found that 90 percent do not think there should be a CGT on KiwiSaver earnings. That leaves just 4.4 percent – next to no one – that support the idea. Ninety percent is a very clear majority, even with a margin of error of 3.1%. Fairness and justice that are motivating supporters of a CGT are abstract concepts but neither would be improved by the proposal put forward by the Tax Working Group with three of its members dissenting. The proposal would be both unfair and unjust and would do nothing to counter the inequity which concerns its supporters. Anyone who owns a business, including a farm, shares, bach/crib/holiday home, lifestyle block bigger than .45 hectares, or rental property; anyone who claims expenses for a home office; has intellectual property, anyone who owns a home and moves into a rest home without being able to sell it within a year, or buys another and can’t sell the first within a year, or goes overseas for a while; anyone who buys a section for a new home that isn’t completed within a year; any homeowner who forms a relationship with another homeowner; and anyone who has taxable assets and migrates. A lot of people would be hit by the tax directly but everyone will be hit indirectly when costs go up and the economy slows. Tax officials advised the Government 15 months ago that our small companies, start-ups and innovators were better off without a Capital Gains Tax, Leader of the Opposition Simon Bridges says. “Even before Sir Michael Cullen and others were named to the Tax Working Group in December 2017, Inland Revenue officials told the Government that the absence of a Capital Gains Tax in New Zealand was ‘potentially advantageous to start-ups’. “Not having a Capital Gains Tax is ‘advantageous’ to every Kiwi willing to give it a go by starting a small business and creating jobs. People who take risks with smart ideas and build something bigger than themselves shouldn’t be discouraged. “Governments should encourage innovators because smart people will take us to a better future. We need people who take risks and stretch themselves because the ones who succeed create more jobs. That’s another consequence that would hit a l9ot of people – disincentive to invest and carry out succession as aging farm and other business owners hang on instead of selling. If it’s going to reverse that the government must take a much more frugal approach to its own spending and axe the CGT. If there’s such a good thing as a good tax, it’s one that discourages things we don’t want and encourages things we do. That’s where the Tax Working Group was handicapped from the start when the government ruled out any CGT on the family home. A CGT hasn’t had any impact on keeping house prices down in other countries, but if, as we’re constantly told New Zealander’s over-invest in their houses, taxing other capital gains and leaving houses alone will only make matters worse. We’re also told, with good reason, that New Zealand lacks savings and investments. Why then would a government introduce a tax which disincentives them? If has been widely forecast the Tax Working group’s report recommends a CGT on savings, investment and businesses and not on family homes, it will be getting the tax the bad more and the good less rule back to front. It will almost certainly get a lot more wrong. Revenue Neutrality: Given the Government’s surpluses, any revenue from a capital gains tax must be used to fund tax cuts in other areas so that the total tax burden does not increase overall. Fairness, which is the supposed motivation for introducing a CGT, is very much a matter of opinion but if the proposals from the TWG don’t meet the five rules, it will be anything but fair and do more harm by disincentivising savings and investment.